The smell of the mandarin oil is sharp but sweet as Virna massages my arm. Her hands move seamlessly as she works the leaden muscles. As I stare at her, she raises her head to smile at me, and I wonder yet again why I didn’t notice hope when it first arrived in my life. At first all I knew was that Virna never showed her teeth when she smiled and she twitched her leg nervously as she sat cross-legged in a chair. She’d started working at my care home as a relief caregiver, and I noticed such details about her because that’s what you do when people don’t talk to you. But then Virna started speaking to me, and I realized she was someone I could never forget. Most people speak at, around, over, or about me, so anyone who treats me like a cut above the average root vegetable is unforgettable. One afternoon Virna told me her stomach was aching. It’s the kind of everyday confession I’ve heard from the people around me for years as they’ve chatted unguardedly, thinking I’m not really with them. What I know about some of the caregivers’ health problems is hardly worth knowing: one has a husband with Alzheimer’s, another has problems with her kidneys, and one woman’s vaginal tumor almost left her childless. But when Virna spoke to me it was different. She wasn’t talking to herself, someone else, or even the empty room like most people do. She was speaking to me, chatting as she would to anyone her own age about the thoughts that floated through her mind like dust motes in sunlight. It was a conversation any twenty-something friends might have but I’d never experienced it before. Soon Virna started telling me about everything from the sadness of her grandmother’s illness to the new puppy she’d got and the boy she was excited to be going on a date with. I felt almost as if I was making my first friend. That was the reason I started looking at Virna, which is not something I often do. My head usually feels like cinder block when I try to lift it, and I’m rarely at the same eye level as other people because I’m always sitting in a chair or lying down. It takes so much effort that a long time ago I gave up making eye contact with people who look but never see. I sit for hours each day staring blankly into space. But that changed when Virna began giving me and some of my fellow inmates aromatherapy massages to soothe our twisted limbs. Lying on my back while she kneaded my aching muscles, I was able to let my eyes follow her as she spoke to me, and bit by bit I started to peep out from the shell I’d retreated into. Virna looked at me properly, which was something no one had done for a long time. She saw that my eyes really were the windows to my soul and became more and more convinced that I understood what she said. But how could she convince anyone else that the unresponsive ghost boy was capable of more? Months turned into one year and then two. About six months ago Virna had seen a TV program about a woman who’d been helped to communicate after being rendered mute by a stroke. Soon afterwards Virna went to an open house day at a nearby center where she’d heard experts talk about what could be done to help those who can’t speak, and she came back excited to tell me about what she’d learned. Other care staff had also gone to the open house day but weren’t as convinced as Virna was that I might be a suitable candidate. 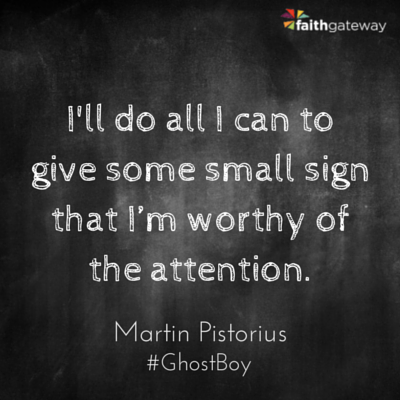 “Do you really think he’s got it in him?” one of them asked after she’d spoken about her hopes for me. The woman bent towards me with the shadow of a grin on her face, and I smiled to try and show her that I understood what she was saying. But my only two gestures—jerking my head down to the right and smiling—are interpreted as the knee-jerk reactions of an undeveloped mind, the kind of responses that any six-month-old baby can make, so she didn’t take any notice. The caregiver looked at me and sighed as her grin faded. I wondered if she knew that her breath was bitter from the coffee she’d recently been drinking. “Can you imagine anything so ridiculous?” she said later to her friend after Virna had left. “There’s no way any of them could communicate.” The two women looked around the room. They looked at a little boy who was playing with a toy car nearby. The women were silent for a moment before their eyes came to rest on me. They didn’t say anything as they looked at me sitting in my wheelchair. They didn’t need to. I know I’m considered one of the lowest functioning subjects in a place where the only entry requirement is an IQ of thirty or less. Despite all these doubts, Virna wouldn’t be swayed. A fire of conviction had been lit within her. After telling people again and again that she thought I could understand what was being said to me, she’d spoken to my parents, who had agreed to have me tested. Tomorrow they’re taking me to the place where I might finally be offered a key to my prison door. “You’re going to do your best, aren’t you?” Virna says now as she looks at me. I can see she’s worried. Doubt flickers across her face like cloud shadows racing across the horizon on a sunny day. I stare back, wishing I could tell her that I’ll use every fiber of my being to make the most of an opportunity I never thought would come. This is the first time I’ve ever been assessed like this, and I’ll do all I can to give some small sign that I’m worthy of the attention. I look at her. Tears glimmer silver in the corners of her eyes. Her faith in me is so strong I must repay it. 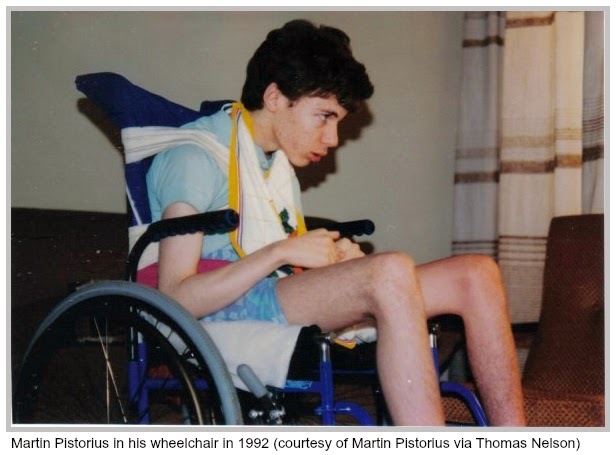 Excerpted with permission from Ghost Boy: The Miraculous Escape of a isdiagnosed Boy Trapped Inside His Own Body by Martin Pistorius, copyright Thomas Nelson.